Adele Cobb Kerrigan was in her eighties in 1953, when she completed her 100-page typed manuscript on the genealogy of the Bettis family. It is an extraordinary document, an indispensable source for Bettis history, the record of a lifetime’s dedication to the memory of her and my ancestors. It is also crammed with errors, some of them absurd; sentimental portrayals of people about whom she knew almost nothing; and one lengthy account of an interview with a psychic horse. 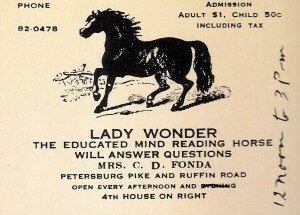 The horse, Lady Wonder, spelled out the answers to Kerrigan’s questions by moving wooden letters with her nose. Kerrigan was an early member of the army of amateur genealogists, a tribe of obsessed researchers that has spread across the internet in the decades since her death. Their efforts have made enormous amounts of information available to anyone with an interest in looking for it. Most large families have at least one such volunteer, sometimes not even a blood relative of the family. My own indispensable guide was a Texan named Lou Poole, who shared with me his hundreds of pages of carefully researched and organized files on the Drew, Parker and Maxwell families, and who once advised me to be careful about my “liberal” interpretations. 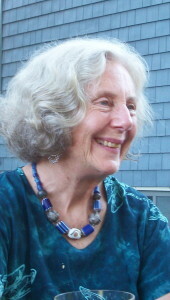 Unlike Lou, many internet genealogists are still repeating Kerrigan’s errors, including paying no attention to dates and accepting the statements of others without critical analysis. In some family trees, sons may be listed as being born when their fathers were ten, or two years after their mothers’ deaths, or as having fought in the Revolution before they were born. Conflicts between family myths and recorded documents have occasionally given rise to vicious, months-long arguments, complete with hurled insults and nose-thumbing in ALL CAPS and multiple exclamation points. Some lists of the descendants of prominent figures on ancestry.com are little short of gibberish, but nevertheless other researchers adopt them and pass them on. And then there are the true genealogy heroes, like the unnamed volunteers of the Brantley Association who, since 2008, have not only digitized but indexed all of the court, marriage, deed and will records of Southampton County Virginia, from 1749 to 1880 (http://www.brantleyassociation.com/pages/southampton_project.htm.) It was those records that allowed me to map out the social structure of the county, and the shifting relationships of my ancestors, their relatives, their free mixed-race neighbors, and the local Baptists as the county evolved. It was also those records that allowed me to unravel the story of the Bynum lawsuits, a tangled skein of betrayal and official indifference that marked both the dramatic drop in the status of Southampton County’s free people of color, and the end of the frontier period of the county’s history. Great post. I always wonder about the efficacy of the various genealogies, the accidental typos, the bad faded hand-writing. And it could all be solved by Lady WONDER!!! !